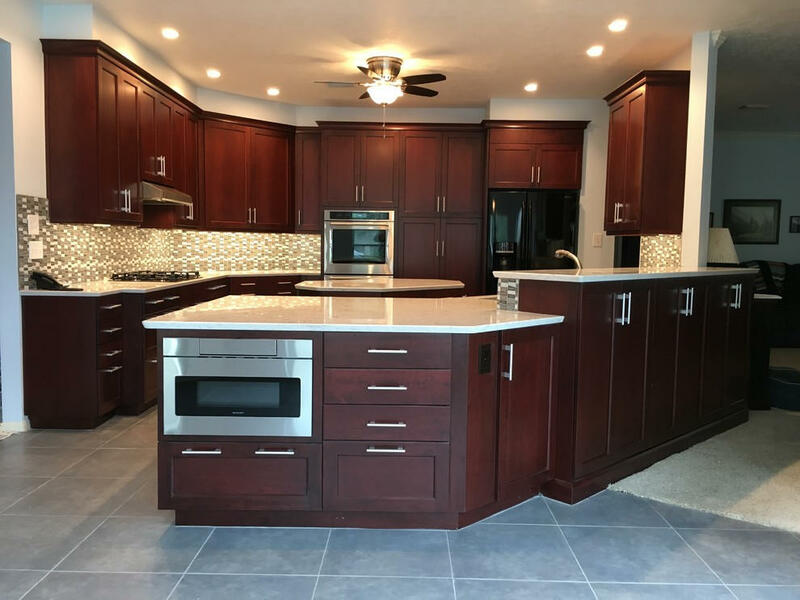 This Friendswood kitchen remodel by Randy Godeau of Bay Area Kitchens features rich dark cherry custom Brookhaven cabinetry by Wood-Mode, and yet is light and bright due to its extensive lighting plan utilizing all high-efficiency LED lighting. Low maintenance Silestone Lyra countertops reflect the light to bolster the brightness of the kitchen. Drawers in most of the base cabinets offer the most efficient storage in all the right places. The drawer microwave faces the breakfast area for quick and efficient warm-ups without getting in the chef’s way. Concealed angled power strips provide lots of outlets that are tucked neatly out of sight below the upper cabinets so the glass backsplashes are not chopped up with traditional electrical outlets. 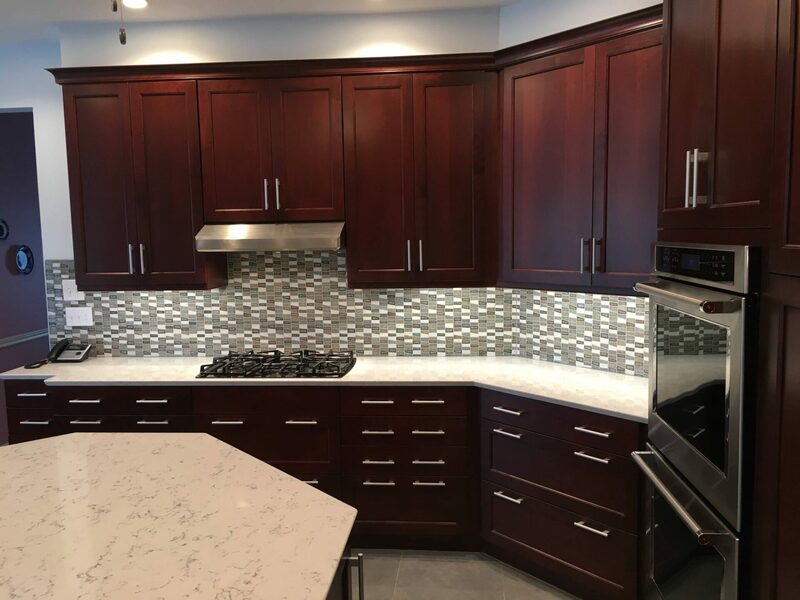 This Friendswood kitchen remodel by Bay Area Kitchens features rich dark cherry custom Brookhaven cabinetry by Wood-Mode, and yet is light and bright due to its extensive lighting plan utilizing all high-efficiency LED lighting. Low maintenance Silestone Lyra countertops reflect the light to bolster the brightness of the kitchen. Drawers in most of the base cabinets offer the most efficient storage in all the right places. The drawer microwave faces the breakfast area for quick and efficient warm-ups without getting in the chef's way. Concealed angled power strips provide lots of outlets that are tucked neatly out of sight below the upper cabinets so the glass backsplashes are not chopped up with traditional electrical outlets. 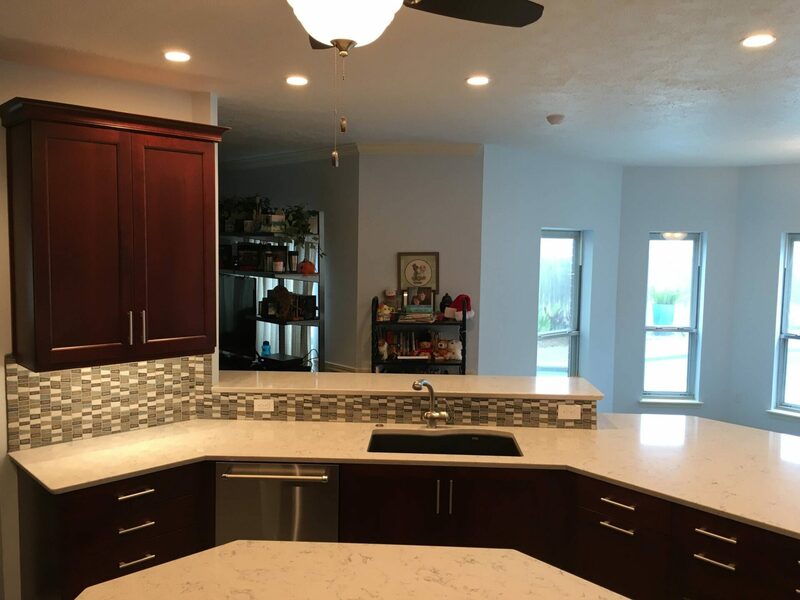 This Friendswood kitchen remodel features rich dark cherry custom Brookhaven cabinetry by Wood-Mode, and yet is light and bright due to its extensive lighting plan utilizing all high-efficiency LED lighting. Low maintenance Silestone Lyra countertops reflect the light to bolster the brightness of the kitchen. Drawers in most of the base cabinets offer the most efficient storage in all the right places. Concealed angled power strips provide lots of outlets that are tucked neatly out of sight below the upper cabinets so the glass backsplashes are not chopped up with traditional electrical outlets. 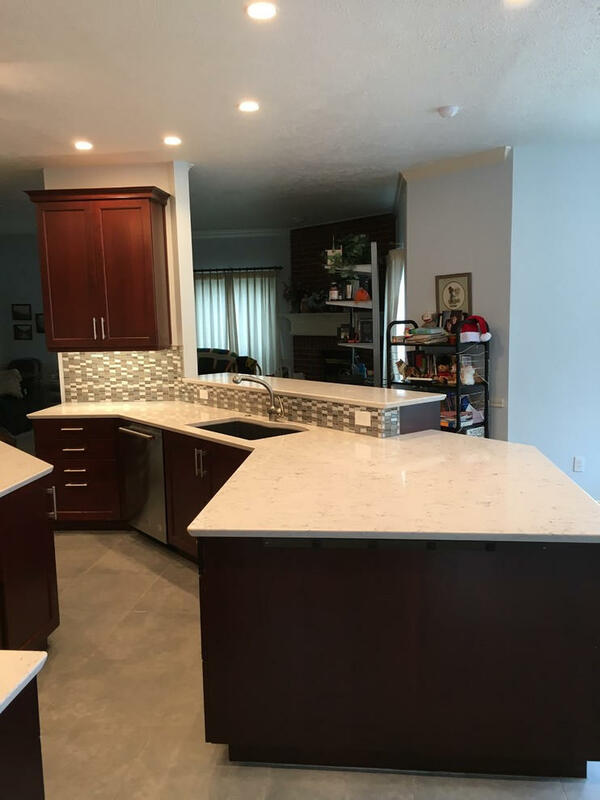 This Friendswood kitchen remodel features rich dark cherry custom Brookhaven cabinetry by Wood-Mode, and yet is light and bright due to its extensive lighting plan utilizing all high-efficiency LED lighting. Low maintenance Silestone Lyra countertops reflect the light to bolster the brightness of the kitchen. Drawers in most of the base cabinets offer the most efficient storage in all the right places. 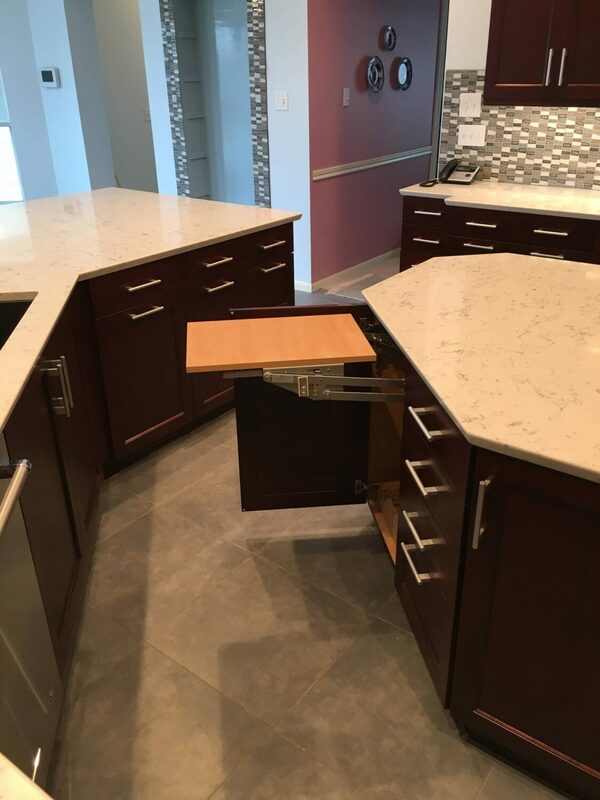 Concealed angled power strips provide lots of outlets that are tucked neatly out of sight below the upper cabinets so the glass backsplashes are not chopped up with traditional electrical outlets except where there are no upper cabinets as shown here. The low maintenance Silestone Lyra island countertop reflects the light to bolster the brightness of the kitchen. The island provides a central work station with easy access from all sides. 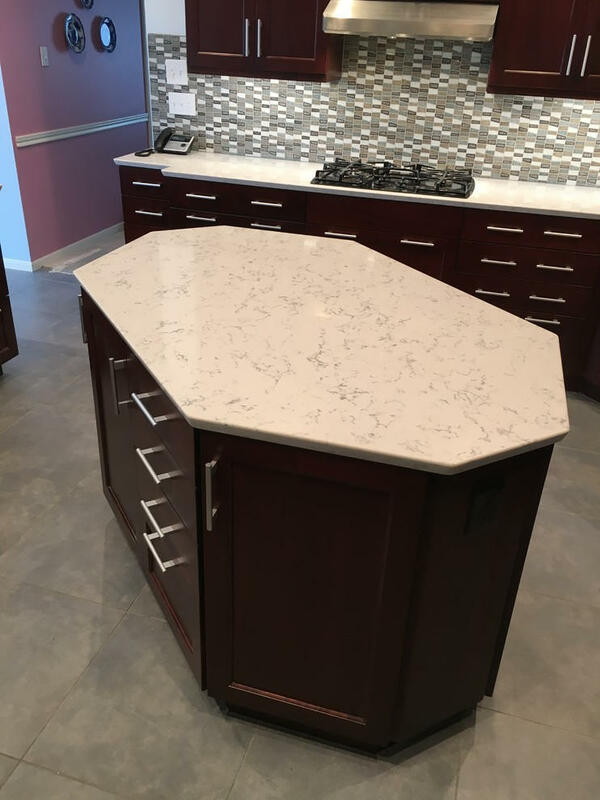 The angular shape of the island provides a smooth traffic flow throughout the kitchen. This special cabinet features a heavy-duty pop-up shelf providing storage for most large mixers. Raising and lowering the mixer is easy due to the special spring-loaded mechanism. 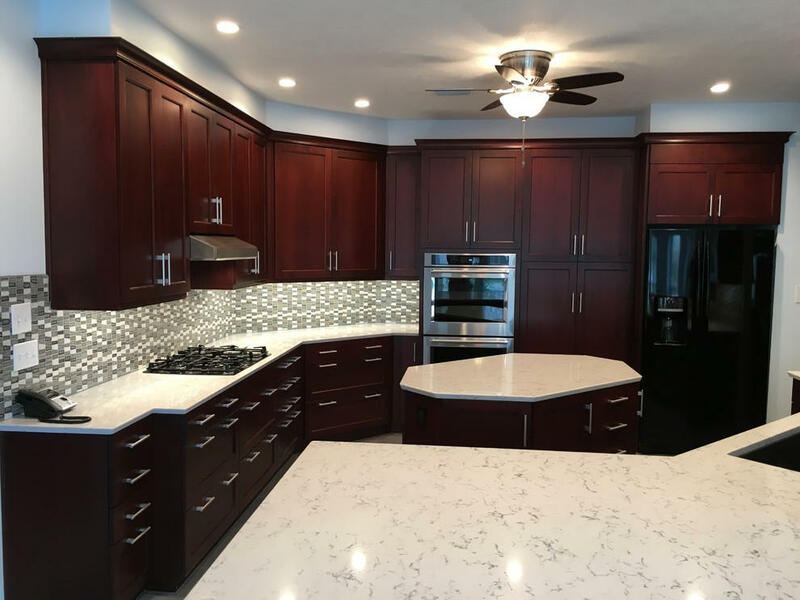 This Friendswood kitchen remodel features rich dark cherry custom Brookhaven cabinetry by Wood-Mode, and yet is light and bright due to its extensive lighting plan utilizing all high-efficiency LED lighting. Low maintenance Silestone Lyra countertops reflect the light to bolster the brightness of the kitchen. Drawers in most of the base cabinets offer the most efficient storage in all the right places. Concealed angled power strips provide lots of outlets that are tucked neatly out of sight below the upper cabinets so the glass backsplashes are not chopped up with traditional electrical outlets. The Vent-A-Hood brand hood is efficient and beautifully understated.